"Oreste Dal Zovo" Wine Store thanks you for your interest in visiting our Internet site. Founded in 1958 in Verona (Vicolo San Marco in Foro 7), the Wine Store & Bar is near the Well of Love, the inspiration for an ancient Mediaeval legend. "Oreste Dal Zovo" Wine Store & Bar offers an impressive and huge range of Italian and interalnational wines, including prestigious vintages. 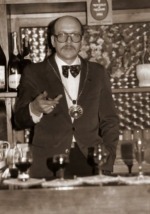 Owner Oreste is a FISAR accredited "sommelier" and always ensures a warm welcome. The setting is extremely elegant and comfortable for complete enjoyment and appreciation of the range of products.